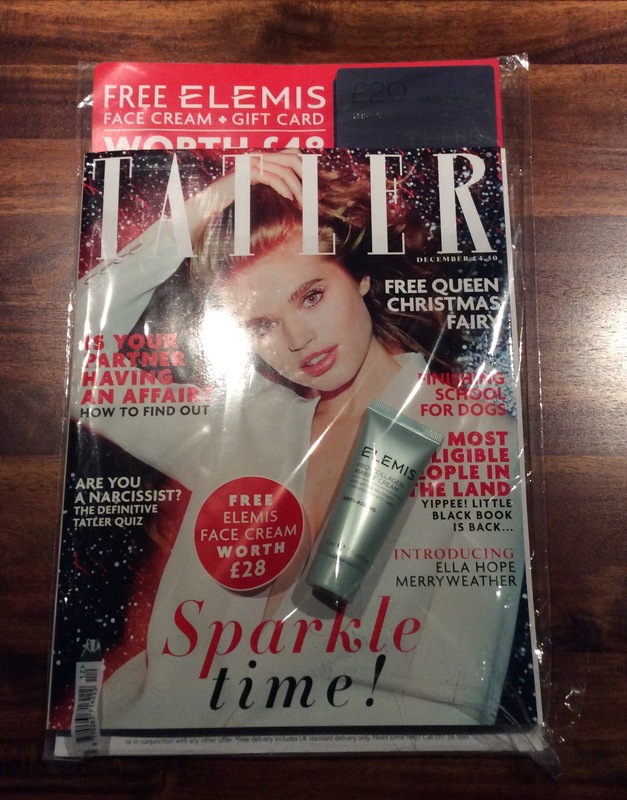 Subscribe to Tatler for just £6 for 3 Issues by Direct Debit (DD) and you will get a free Birchbox Gift with subscription – package worth over £38 – (see photos below for details) always usually an offer on so if this particular offer has finished just check online for other offers. 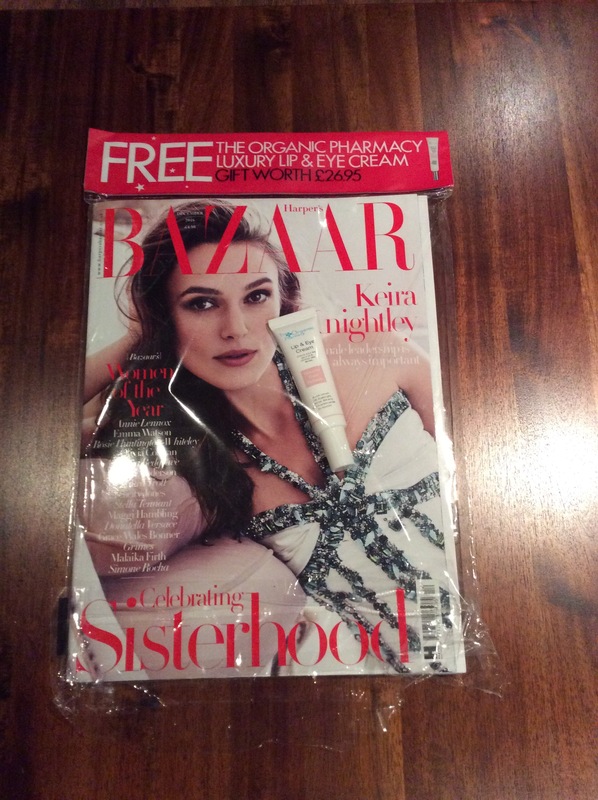 HARPER’S BAZAAR = £4.50 – A Free The Organic Pharmacy Lip & Eye Cream– 10 ml worth £26.95 – free sample card of Giorgio Armani Si also included within magazine. Subscribe to Harpers Bazaar for £10.00 for 6 issues by Direct Debit (DD) –free L’Occitane Almond Supple Skin Oil worth £34 (love this range from L’Occitane) with subscription – (see photos below for details) always usually an offer on so if this particular offer has finished just check online for other offers. 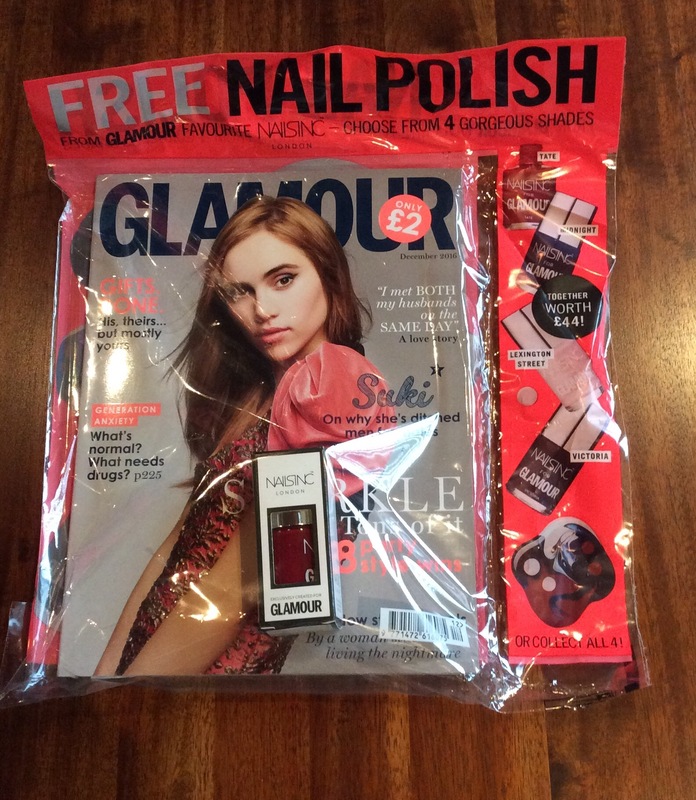 GLAMOUR = £2.00 – Free Full Size Nail Inc Nail Polish (10 ml) – worth £11.00 and choice of 4 shades. 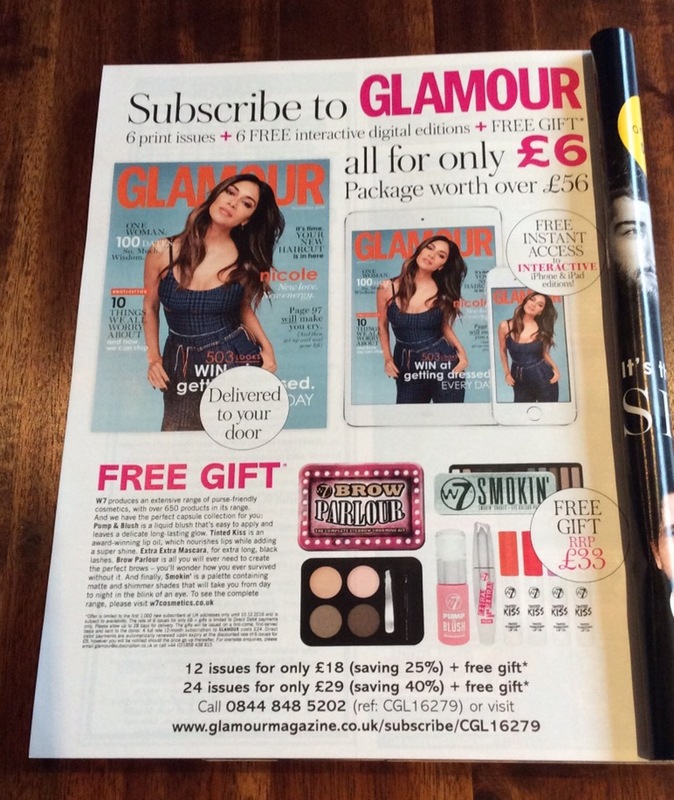 Subscribe to trial offer of Glamour for just £1 for 3 Issues by Direct Debit (DD) and you will get a free welcome gift worth £33 with subscription – (see photos below for details) always usually an offer on so if this particular offer has finished just check online for other offers. 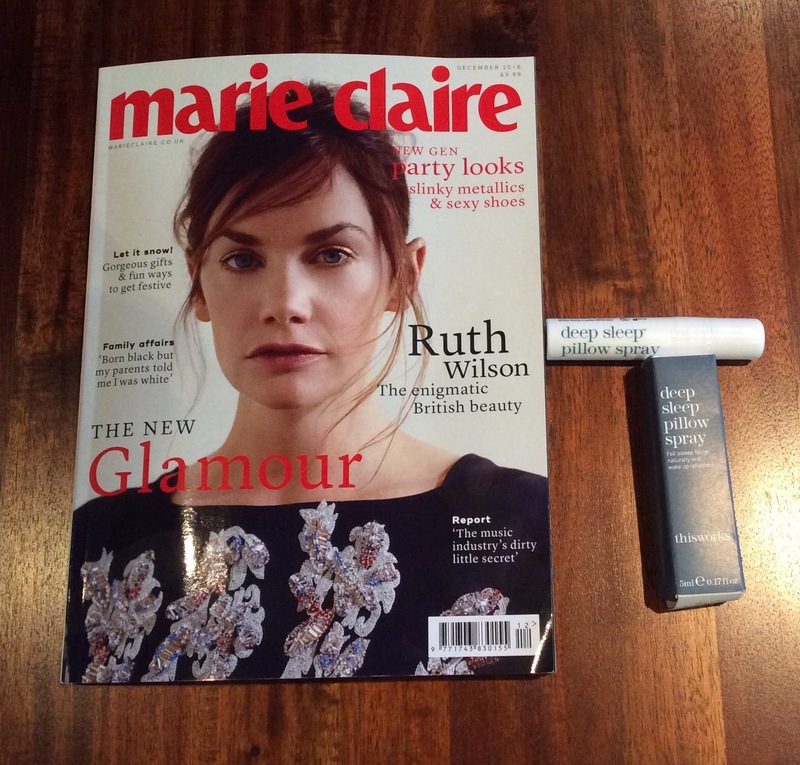 MARIE CLAIRE = £3.99 – Free This Works Deep Sleep Pillow Spray Travel Size (5 ml) – comes in box as well. Note free gift may not be available with the magazine in all shops /stores so please check first. Subscribe to Marie Claire for £18.99 for 12 Issues and you will get a free Erno Laszlo welcome gift worth £50 with subscription – (see photos below for details) always usually an offer on so if this particular offer has finished just check online for other offers. ELLE = £4.10 – Free Leighton Denny Nail Polish (12ml) – £12.00 – choice of four colours and free sample sachet of L’Oréal Elvive hair masque and a Lancôme fragrance sample card included within magazine. Subscribe to Elle for £10.00 for 6 Issues and you will get a free Percy & Reed Shampoo and Conditioner worth £38 with subscription – (see photos below for details) always usually an offer on so if this particular offer has finished just check online for other offers. As advised previously each month I will update each month’s magazine freebie post when I see additional magazine freebies or when relevant offers become available. (once again a reminder that magazines always dated month in advance i.e. you get the December issue in November). Hope this helps – any comments / queries please let me know. Would also love you to know if you have or are thinking about getting any of these magazines or subscribing. If not already subscribed / following my blog would love you to follow – would mean a lot. Hi, do you perhaps know what nail polishes will be (are) in the newest Elle magazine? It would be a good suggestion if you can update this post or write new once as a series as I will definitely want to buy some of those magazines. P.S I ordered online the Glamour one and cannot wait to try NailsInc polishes.